Journey through the doors of the cuckoo clock and into its inky innerworkings to discover a magical land ready and waiting for you to customize with whatever colours you can dream up. 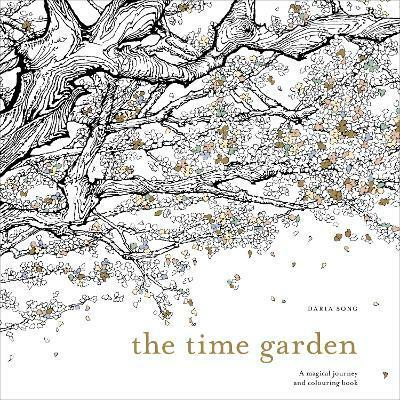 The Time Garden is an international best-selling colouring book and this edition finally makes it available in English. Full of beautifully detailed illustrations, this is the perfect gift for colouring fans of all ages. Daria spent five years of her childhood in San Francisco before returning to South Korea, but never lost the sense of wonder, mystery and surprise that comes from living in a far-off place. She majored in art at the prestigious South Korean Ewha Womans University and her studies there helped inspire her to create the best-selling adult colouring book, The Time Garden, and its follow-up, The Time Chamber. Daria has a master's degree in fiber arts and her textile and wood works reveal elaborate workmanship and are well-known to collectors in Korea, widely seen as works that awaken the innocence of childhood in adults. Her illustrations can be found in many magazines and company catalogues such as Amore Pacific and SK Planet. And she has exhibited at numerous galleries in Korea, Singapore, Turkey, and Hong Kong including Imazoo Gallery, Sun Gallery, and Seoho Museum of Art. Daria is also a lecturer at the Kaywon School of Arts, and also organizes workshops at well-known art academies, opening these institutions to amateur artists interested in arts and crafts.